In reading the kanji for Kage Ryu readers will observe it is the Kanji for Keishiki meaning a view/scene or indistinct 影流. This is the original name of the Ryu, and it has not been changed since inception in the mid sixteenth century. There are many Makimono (scrolls) and manuscripts and other evidence that supports the Ryu. It's teachings and practices and tradition which of course includes the verbal teachings that have been handed down throughout the generations. The kanji should not be confuse with 陰流. This is the name of the ryu founded by Aizu Hyūga-no-Kami Iko later to be renamed as the Yagyu Shinkage Ryu. Since this page was first posted online I was given the densho of the Shihan Yamazaki Buzen rewritten around 1862 This densho points to fact that this particular kanji is used by the founder Yamamoto refers to the indistinct shadow of a monkey he observed. 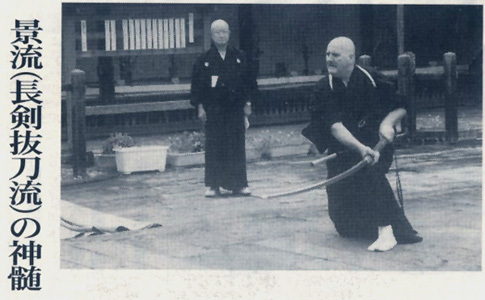 The previous Shihan Takamuku Mioji relates to the shadow of a monkey reaching out with a stick to obtain an object thus extending his capabilities. The founder of the Kage-ryu was Yamamoto Hisaya Masakatsu of Akizuki Han. Akizuki is a part of present day Amagi-shi in Fukuoka. Next to this is Kasuya-gun, the home of the first Lord Tachibana. Yamamoto was a retainer of the clan. The second Lord Tachibana Muneshige moved to the Yanagawa fief in 1590. He had received this land from Hideyoshi Toyotomi, as he had fought with him leading Otomo Bungos advanced guard. Naturally Yamamoto went with him when he moved to his aquired fief. It stretched from the South of Fukuoka right down to the border of the Hosokawa fief (Kumamoto Ken).The location of the old Yanagawa domain was a castle town up until the Meiji restoration. It is in present day Yanagawa-shi (City). There the Tachibana line remains unbroken to this day. Although the castle is long gone the family still preserves many precious treasures, documents and displays them in rotation in a hall of history although we are independant the patronage and links to the family adds credibilty to Kageryu as a living tradition. There are also are many living traditions associated with the Tachibana clan, Kageryu was one of these. The Tachibana family also maintain traditions of the Hosokawa Clan as a present 17th generation second son is married to the 17th generation descendant of this clan. The original name of Tachibana was given by the Empress Gemmei in 708 the family moved to the Yanagawa domain in the Edo period. Tachibana Muneshige had been rewarded this fief by Toyotomi Hideyoshi. They were disspossesed by the Tokugawa shogunate after the battle of Sekigahara. Links are still made with the Toyotomi family through the Nakazawa line. 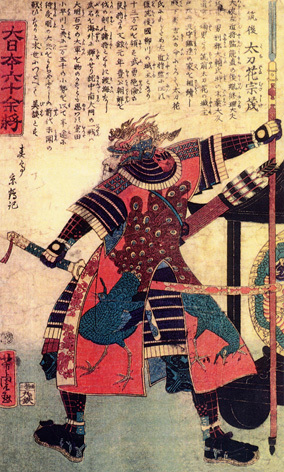 The Tokugawa Shogunate standardised the size of swords in Japan to Jo-sun. 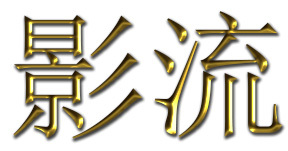 This is written as Tei-sun meaning designated length. This was 2 shaku 3 sun (64.7 cms) [one shaku is just under a foot], whereas one sun is just under one and a quarter inches. Shaku, sun, bu, rin is a decimal system. To maintain control over the country the Shogun would arrange for his loyal clans to keep an eye on those considered not to be so loyal. It was for this reason that the neighbouring Nabeshima clan paid visits to the Tachibana Fief to ensure that the Tokugawa laws were being observed. The Nabeshima fief, now Saga City is about a one hour horse ride from Yanagawa. An interesting fact is as Yamamoto Tsunetomo dictated to his scribe the aphorisms of the Hagakure Kikigaki, anecdotes lamenting the failing ways of the samurai in the Nabeshima fief in the early 1700's But he was not aware that the Kageryu was in Yanagawa busy carrying on the tradition that Yamamoto thought was disappearing. Determined not to have the Ryu and it's weapons standardised, the Ryu practised in secret. It became an Otome Ryu (that which flows but remains at home). Another term used to describe a secret sword style is Mongai Fushutsu, (not to be taught outside the gate).nowadays the ryu is taught outside Yanagawa. Like most ryu there is no hereditory succession. The title given to a current leader of the ryu is Shihan. The title Sohke has never been used. Anyone purporting to be Soke of the ryu would be a phoney. Shown left :The Jingai 法螺貝 made from a Horagai (Triton shell ) used to begin embu for the Kageryu and other ceremonies. Used by the Yamabushi 山伏 to keep in contact with each other as they travelled across the mountains from place to place and in ceremonies at temples and shrines. Like swordsmanship there are certain fundamentals related to the Jingai. The word fuku (blow) is never used, but the sound is made to rise (hora wo tatsu). The Jingai must never be placed with shell mouth facing down. This is considered to be very impolite and unlucky. Elevated upwards it is blown using the side of the mouth and there are three rolling notes played in a flowing manner. They can be of set melody for ceremonies in Shrine or Temple or a certain amount of free expression can be used for normal occasions. There are generally no hard and fast rules to the order of notes played with the exception to ceremonies at shrines or temple. With the Yamabushi 山伏 it is one of the few times we see a Buddhist ceremony held at a Shinto Shrine.